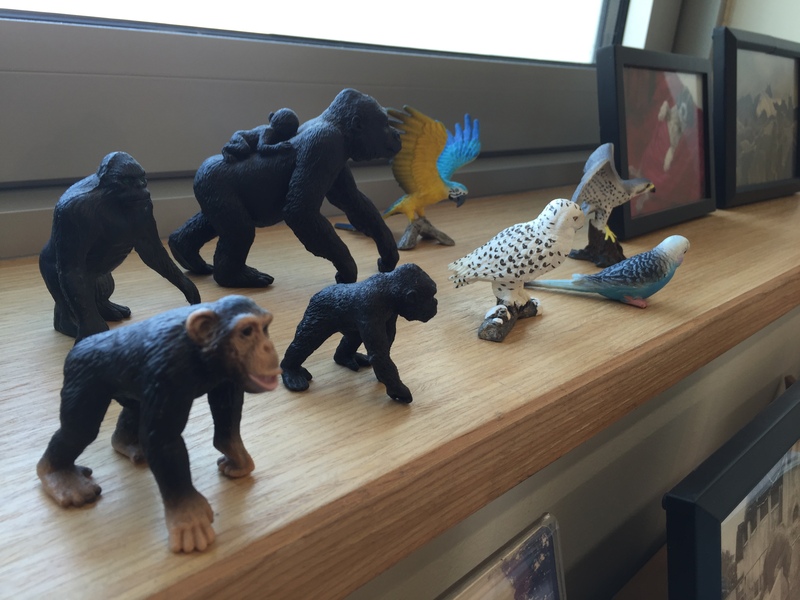 Siebert keeps his precious animal figurines on the windowsill of his office at NYU Abu Dhabi. Photo: Sebastián Cabral. As a kid who grew up in the city, Charles Siebert spent a good deal of time staring at animals in the zoo. Non­humans made a lasting impression on him. To confirm this, it suffices to look at his office. 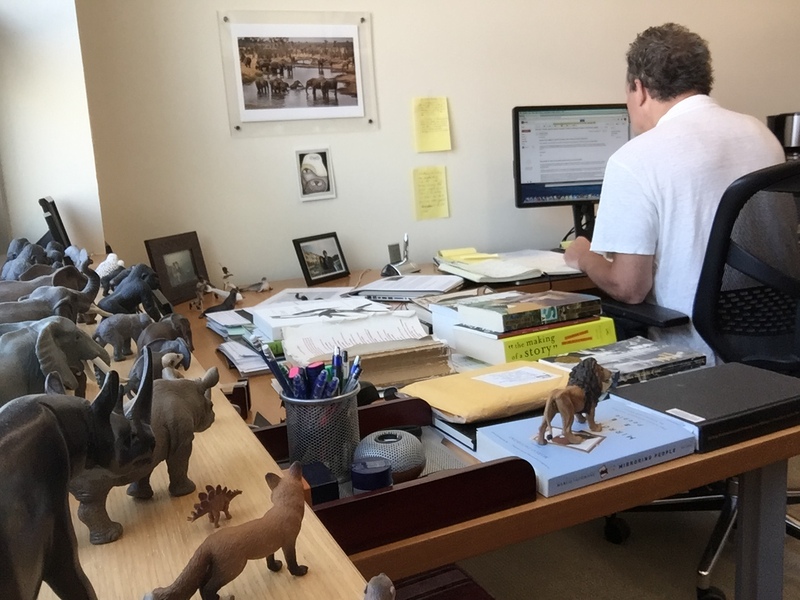 A string of animal figurines parade on the windowsill, as if they were preparing to flank the towers of books and opened notepads that clutter his desk and encircle his keyboard. He has seen and written about most of these animals in their natural habitats–everything from elephants to beluga whales and seals. Joining this menagerie is a group of meerkats; plastic transplants from the Prospect Park Zoo in Brooklyn, just blocks from his longtime apartment. Those, Charles tells me, are there for whenever he feels homesick. ES: What is it about animals that makes for such great stories? CS: They’re easy interviews; they don’t talk back [laughing]. I think I know what it is. Part of it is rooted in the childhood fascination with the non-­us. Being able to stare into a chimp’s eyes and wonder what’s going on there, knowing that there’s a “there” there. Like someone who’s not human but is definitely cognizant. So, as a little kid, in my own dim way, I kind of intuited that. And I think it’s a fortunate happenstance of history that the science on animal intelligence has developed to an extent where it’s freed up storytellers to be more imaginative and even anthropomorphic in our conjecturing, but without the sin of anthropomorphism. Science of all things—which is supposed to be the enemy of mystery and storytelling—has allowed us to be better storytellers. That’s why I write a lot about science, because I see the poetry in science now. I couldn’t when I was younger. With animals specifically it has freed us up from the old dictate that held us back from writing about animals—the B.F. Skinner behaviorist thing of we can’t even know what each other are thinking, so how could we write about an animal? My point, that I make ad nauseam, is, well, science has now shown us that while we will never know what it is to have a whale day or an elephant day or chimp day, we do know that they have days and that we can ruin them. Science has shown us that [animals] have minds enough to lose—a phrase that I use a lot in my writings—and that’s why it’s so exciting to write about animals. And the more we find out about them, like with the parrots and with the elephants and with the whales and the chimps, the more we understand how like them we are, and the more like us they are. So we’re learning about these structural homologies, as they say in science; the analogies, the parallels. All those things make it I think the richest time in the history to write about animals. Richer even than in Darwin’s day. It’s almost like we’re back to the mythological age, but armed with science rather than fantasy. The animals on Siebert’s windowsill include a parrot, the subject species of his most recent article for the New York Times Magazine. Photo: Sebastián Cabral. ES: What’s the first close encounter with an animal that makes you think, “I’m gonna write about these guys”? So I went down to Louisiana, and I saw this still uninhabited retirement facility that was in the final stages of construction. And it was hysterical. Because I thought, “I wanna retire here. This is gonna be nicer than my retirement.” You know, they had nice little rooms, showers, and their own little backyards with a swing set. And then they had their own little fenced off section of woods to play in. I went back there when the first chimp arrived. And that was a very moving moment, you know, a chimp being freed from a cage and padding along on the ground for the first time. That was incredibly moving. Same thing happened with the parrot story. One of the first days I’m there, a caique parrot from the Amazon just got on my head and on my shoulder and walked around and then dove into my shirt pocket and took a nap, and then came up again, and started to clean my teeth. That was just so funny. And she plucked out one of her feathers and put it on my shoulder. And I went, “Okay, that’s gonna be my ending.” Actually, I had a two­-part ending because I was reading—and this is why I tell students to read whatever and as much as they can when writing a story—The Book of Beasts by T.H. White, and I looked up a section on parrots [which is] only a page and a half. And at the very end there’s a footnote about Alexander von Humboldt, the German naturalist, and how, when he went into the jungle, he came upon this parrot that was the only remaining vessel of this lost tribe’s language. The parrot was repeating the words of that lost tribe.